In 2012, Qualcomm embarked on a two-building campus expansion to add office, dry laboratory facilities, and related support amenities for the existing and new campus users. As part of a team led by architects BNIM, Auerbach Pollock Friedlander provided theatre and audio-video consulting services for the Amenities Building. The firm’s scope of work began in the programming and planning phases and continued through commissioning. 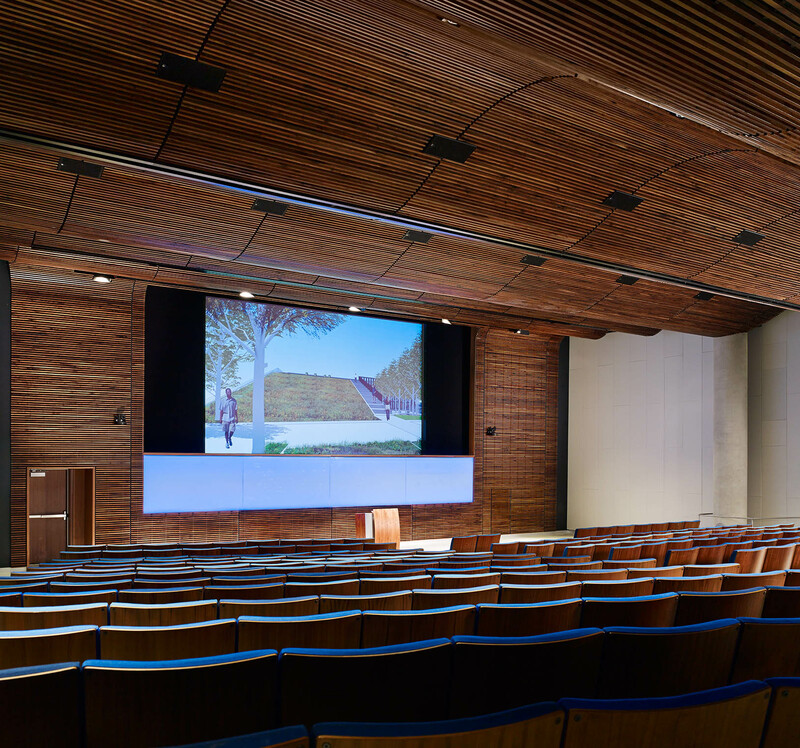 The Amenities Building includes multiple meeting spaces for both internal and customer-facing activities, including a 296 seat engineering lecture hall, a flat-floor flexible meeting space for up to 300 persons at plenary sessions, or divisible to multiple breakaway rooms; a dining facility seating approximately 300 that also supports group meeting sessions of approximately 30 persons; and two outdoor plazas, the larger of which can accommodate groups up to approximately 700 persons. Each of the separate meeting facilities incorporates sophisticated audio-video systems to implement in-room sound reinforcement and visual presentation, live video capture, full-duplex video conferencing, full-duplex audio conferencing, and real-time video streaming at multiple resolutions. The Amenities Building marks the third built project Auerbach Pollock Friedlander has completed for Qualcomm.